Anyone thinking of carrying out Sexual Gender Based Violence (SGBV) in Liberia must now be prepared to face stringent resistance from the Country's law enforcement actors going forward. This development comes after the need to expose SGBV perpetrators and better tighten the grip against the menace was realized, thereby prompting a one week national security sector deliberation on ways to vigorously tackle the ugly act. The dialogue ended over the weekend in Monrovia, bringing together more than 75 participants including civil society and private security gender focal persons. 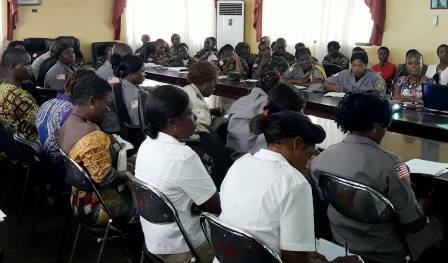 The Justice and Gender Ministries and UN Women organized the working session, hosted by the Defense Ministry and sponsored by UNMIL Quick Impact Project (QIP). Gender focal persons from the Liberia National Police (LNP), the Liberia Immigration Service (LIS), the Drug Enforcement Agency (DEA), the Armed Forces of Liberia (AFL), Executive Protection Service (EPS), the Liberia National Fire Service (LNFS), Bureau of Corrections and Rehabilitation (BCR) were at the roundtable discussion. Key framework for gender equality, sexual reproductive health and rights, introduction to the UN Security Council 1325, and gender mainstreaming in Liberia’s security sector came at the height of the discussion. Participants said they also attained monitoring and evaluation skills on SGBV cases, and gave updates from their respective offices on response to gender related cases. The participants were praised by the organizers for bringing to the table great ideas and experiences, but encouraged to put into practice the skills and knowledge gained. UNFPA Program Officer Dhogba Mbande reported that compromising cases is a serious impediment to the SGBV campaign; as such, communities and law enforcement agencies must better collaborate if the ugly act must stop. He said regular meetings and information sharing amongst anti SGBV campaigners have proved positive over the years when making sure that there is early treatment for survivor and apprehending perpetrators or even support fast adjudication of cases. The Government of Liberia, through the Ministry of Justice is committed to mainstreaming gender in the national security sector.